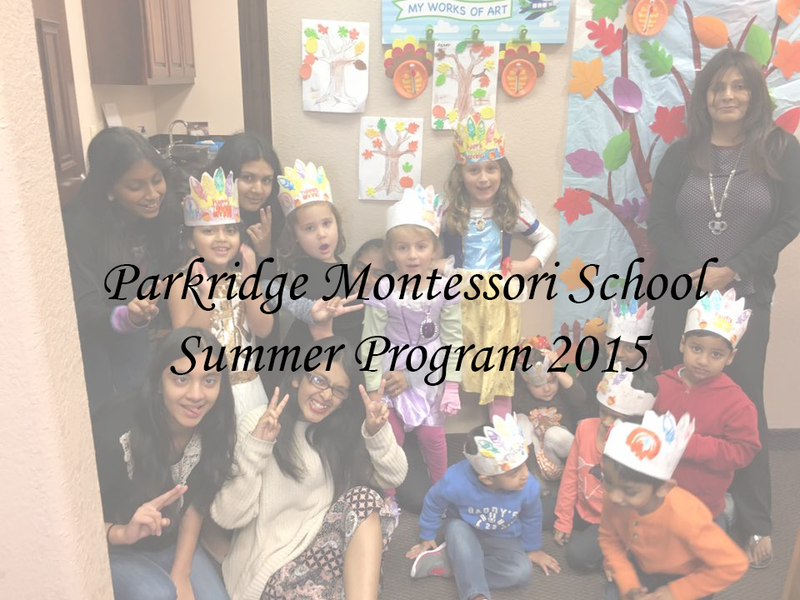 ​Parkridge Montessori School offers year – around Montessori and summer program to students enrolled for the following year. The summer session runs for nine weeks from Monday Through Friday 8.30 am to 3pm. Children will enjoy their Montessori hands on learning as well as summer activities such as weekly crafts, Science projects, art, music sprinkler days and much more revolve around a theme. Summer camp is also open to Children who are not currently enrolled at a Montessori school during the academic year. The classroom consists of children from 3 to 6 years old including kindergarten and elementary children. During the summer we offer nine weeks summer program. The summer program will commence on Monday, June 4, and will end on August 10.​ ​We encourage all new Students to enroll on summer program as it provides a wonderful preparation for the fall program. The summer curriculum is designed to provide a balance of academic enrichment, reading writing fine arts, cultural studies and outdoor activities. We will continue with the basic Montessori curriculum in the language math and sensorial areas while keeping in mind that children are on vacation and fun is a must. There is nothing quite like the elegance of a flying butterfly! We will learn all about this beautiful insect through stories, an interactive metamorphosis activity, and projects. Of Course the day wouldn’t complete without a visit to our Butterfly vivarium where dozens of live butterflies will help us celebrate all we’ve learned. Experiment with the colors of the world as we learn about primary and secondary Colors, color- gradients and rainbows! Brown Bear, Brown Bear and Mouse paint are just a few of the books on our library. We’ll delve into a collection of crafts and projects designed to build visual motor coordination. Young artists will create their own keepsakes using paint, markers, beads buttons, glue. Scissors and tissue paper. Celebrate the USA. We will have a fun filled week. Using the Patriotic red white and blue. We will make many American crafts play games and talk about the stories. Even our cooking project will consists of three colors. Don’t miss out on an unforgettable time learning interesting facts about America our wonderful country. Introduce the culture of Hawaii to children in a luau day. This theme ties in well for summer, as it incorporates all elements of outdoor fun such as playing in the sand Making luau style crafts, listening to music and eating tropical foods that capture the fun and lively luau spirit. Kids will cook, chop and whip their way through the week as they prepare their own lunch and desert every day. We will be baking cookies, pizza, pasta, making lemonade, milkshakes and more. We will go to an African safari to explore the amazing animals of this region from the large African elephant to the weaverbirds of the watering hole; the animals of Africa are so different! We will take a closer look at the lion, elephant, rhino, kudu and more as we travel through our Africa exhibit in search of similarities and differences. We will compare horns, furs, hides, body shapes and habitats. We will also experience the interactive story of zone the Rabbit, a tale from West Africa! What do they eat? These are just a few of the questions we will answer as we travel this diverse land. Under the sea camp includes equal parts imagination and science as we learn real facts about the ocean habitat and wildlife and create our own fantasy worlds as pirates and mermaids. Kids are guaranteed to have a wave of fun all week long. In this camp that Infuses movement’s creative expression, learning, and art. With the used of lots of legos the children use their imagination & creativity to come up with unique design. It enhances innovation; creativity is also helping them collaborate with their classmates. Thousands of Lego blocks are waiting to be made into space ships, cities, parks or any creation you are imagining daily guides activities & free play provides lots of fun and opportunity for exploration, investigation and learning. Every other Friday will have a splash day. Children will enjoy sprinkle fun, a kiddie’s pool and so much more. Outdoor games will be played as well as in this constant flow of fun and excitement. Space is limited and will be allocated on a first come first serve basis, please refer to the following information regarding details of our program. 3. Campers need to bring lunch from home. A complete enrollment packet must be filled out and signed to reserve your child’s space in our summer program. Please remember that all summer program fees are non refundable and must be paid at the beginning of the each month. We will not refund or prorate the tuition fees for days missed. Please Bring: Two Change of extra set of cloths including extra pair of shoes, and a packed lunch. Be sure to label all belongings. No toys from home. Please send a note in there lunch box requiring heating or refrigeration. Sometimes get messy so please dress accordingly.